Two wicked witches known as Draconia (The Dark Queen), and her mother, Princess Callistra (The Wicked Witch of Lotions and Potions), seek revenge against the people of Elysium and Arcadia. They hatch a plot to take control of all the trade of Heart. To achieve their goal, they collect the tears of sadness and regret from thousands of people and distill them into a sadness potion. The Dark Queen employs Admiral Doonotellya and his pirate thugs to do their dirty work. For a share in the gold, the pirates raid key trading ports in Arcadia and set about disrupting the trade in chocolate. Then, with most of the chocolate factories under their control, the witches add the sadness potion to all chocolate products exported from Arcadia. The Dark Queen captures Princess Helen, the crown princess of Arcadia. She casts a spell on the young princess and imprisons her in a Tower of Darkness and Despair. She knows that Prince Charming from Elysium will do anything to reach her and attempt to free her from her prison. She wants them both under her spell so she can disrupt the governments of Arcadia and Elysium and control world trade. Sadness spreads throughout the land as the chocolate loving people are influenced by the evil spell. When King Cedric learns of the pirate raids on the peace-loving people of Arcadia, he decides he must take action. But, when he finds out that all the chocolate imported from Arcadia to Elysium is poisoned, his anger boils over. Sir Gadabout volunteers to travel to the Dark Queen’s realm to find what was used to poison the chocolate. Seeing an opportunity, power-hungry ministers suggest he take crown prince Garvan with him. The mission will be dangerous and they might not come home safe, but the king agrees. Their first challenge is to obtain a list of ingredients to prepare an antidote to the poison. To prepare the antidote, they are instructed to return with a vial filled with water from the Sacred Fountain of Eternal Youth. Their second task is to foster a friendly alliance with the King of Arcadia so they can turn back the pirate threat. Nobody, except the wicked witches, knows about Princess Helen’s imprisonment. Meanwhile, Prince Garvan from Elysium (who is disinterested in almost everything at this stage of his life), has a vivid dream in which Princess Helen appeals to him for help. She warns him of the Dark Queen’s plot to trap him and use him to control both kingdoms. Prince Garvan is beguiled by Helen’s image and promises to do everything in his power to rescue her and find the antidote to the sinister poison. He pledges to bring happiness back to the two kingdoms. When summoned to a briefing about the challenges ahead, he shocks his father by informing him of things foretold by Princess Helen in his dream. Greedy for more control, Draconia forms a secret alliance with the powerful Chan-Liu trading dynasty. But unknown to the Great Chan, it is not sharing she has in mind. She lures Martin, the Great Chan’s son into her lair by magic. Then, to ensure his complete compliance, she threatens to kidnap and harm his beautiful older sister, Miss Yumie. With Martin and the ailing Chan under her spell of enchantment, she hopes to control the mighty Chan-Liu trading dynasty. Will their quest succeed and can they bring peace and return happiness to the people and countries of planet Heart? 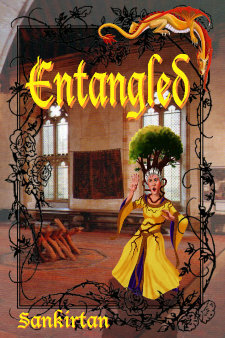 Read Entangled to follow our adventurers as they seek to free Princess Helen and find the secret of the happiness potion.